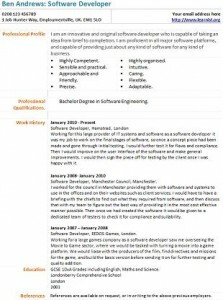 Software Developer CV example and template. Amend as suitable and create your own CV in seconds. If you are interested in computing, enjoy designing and have skills on development then this job can be right for you. Software Developer jobs can be found on the main job sites online. You can also visit IT job boards as well to search current vacancies. – Click here to view latest cover letter examples if you require to write one. – If you have questions about your career then visit our job seekers forums. I am an innovative and original software developer who is capable of taking an idea from brief to completion. I am proficient in all major software platforms, and capable of providing just about any kind of software for any kind of business. Working for this large provider of IT systems and software as a software developer it was my job to work on the final stages of software, so once a concept piece had been made and gone through initial testing, I would further test it for flaws and compliance. Then I would improve on the user interface of the software and make general improvements. I would then sign the piece off for testing by the client once I was happy with it. Software Developer, Manchester Council, Manchester. I worked for the council in Manchester providing them with software and systems to use in the offices and on their websites such as client services. I would have to have a briefing with the chiefs to find out what they required from software, and then discuss that with my team to figure out the best way of providing it in the most cost effective manner possible. Then once we had created the software it would be given to a dedicated team of testers to check it for compliance and suitability. Software Developer, EEDOS Games, London. Working for a large games company as a software developer saw me overseeing the Movie to Game sector, where we would be tasked with turning a movie into a game platform. We would liaise with the producers of the film, find directives and missions for the game, and build the basic version before sending it on for further testing and quality addition.